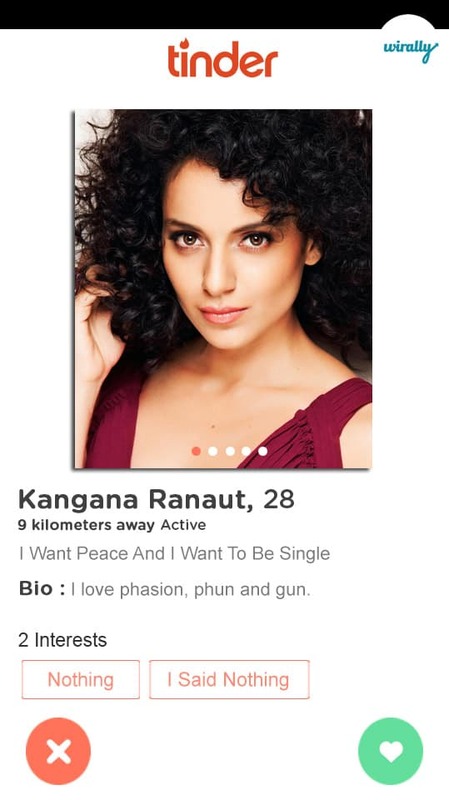 Home Uncategorized These Bollywood Stars On Tinder Would Make Our Lives Jingalala..Part 1..!! 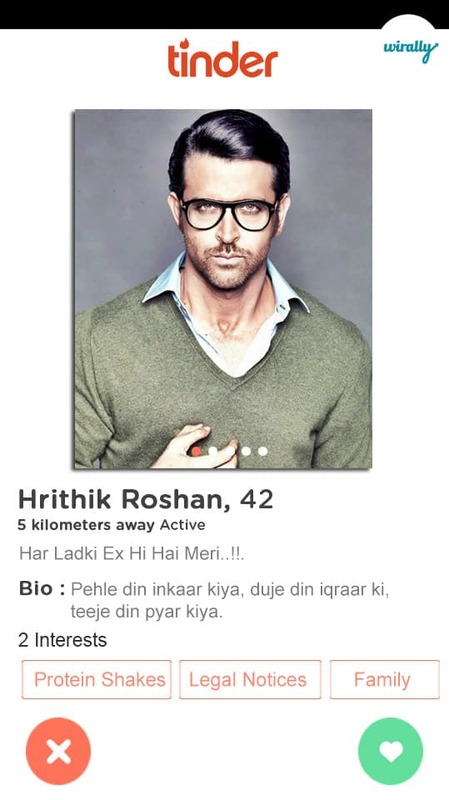 These Bollywood Stars On Tinder Would Make Our Lives Jingalala..Part 1..!! BIO: Hum gunday hai … na aaj tak kisi ke haath aaye hai … aur na aayenge.!! No better than this ‘Can of Red Bull’ to join Tinder. Ranveer Singh has always been open about his relationships. Be it the past relationship with Anushka Sharma or the current steady relation with Deepika Padukone. His great charm will come in handy for impressing and flirting with the matches! BIO : Main paida hi hot hui thi! Alia Bhatt is leading the young actresses’ club in Bollywood today. The news of her being in relationship with her co-stars have made its way to the newspapers a few times but nothing has never been confirmed by this young star. The young lady will be a hard catch on Tinder, swiping right only for one in a zillion profiles. 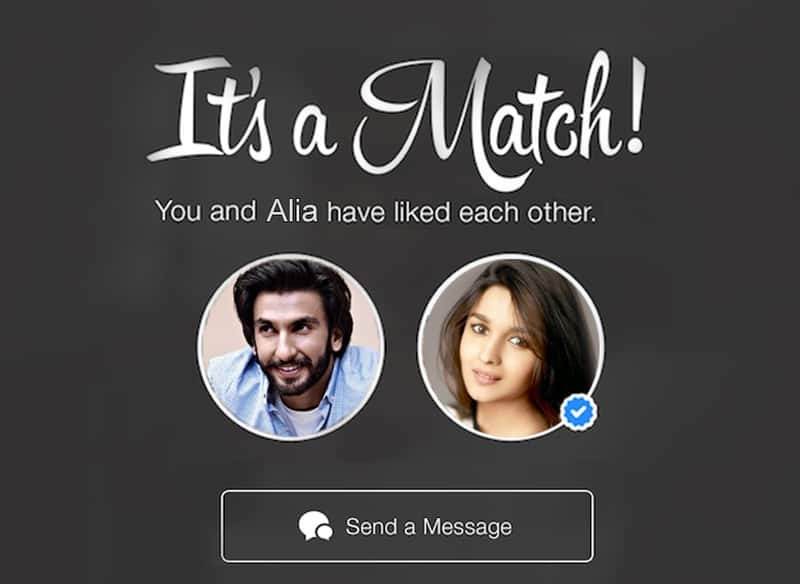 BIO: Pehle din inkaar kiya … duje din iqraar ki … teeje din pyar kiya. After the separation with wife, Suzanne Khan, Hrithik has become the talk of the town. He is single and ready to mingle. What better place to find the next girl to date Tinder. Give the ordinary girls out there a chance at getting lucky! BIO : Thappad se dar nahi lagta sahab, pyaar se lagta hai! Sonakshi has maintained a low profile in terms of her personal life always. Her dad’s onscreen image scares off most of the men that have feelings for her. All the boys who have the hots for her will then have a platform to communicate their feelings to her without the dad being involved. And the fun loving girl that Sona is, we are sure she will have a lot of witty replies to the compliments that come her way. 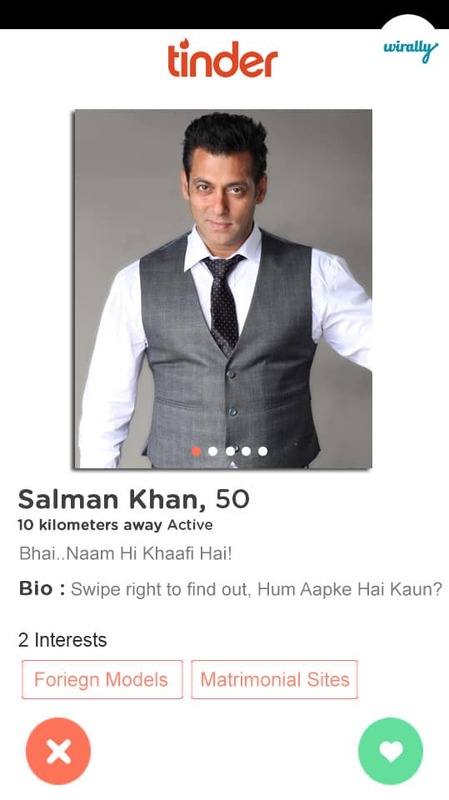 BIO : Swipe right to find out – Hum Aapke Hai Kaun? Salman Khan is a superstar and the evergreen bachelor of Hindi cinema. The actor has never been married and marriage isn’t anywhere on the cards in the near future too. But he has been in and out of relationships with several Bollywood actresses. We wonder who his new muse would be if he signs up on Tinder. I can already hear a million hearts beating faster! BIO : I love phasion, phun and gun. Her performance in Queen made her the princess of Bollywood. Off screen too she has always had very interesting and different take on the way she looks at life. Millions of young men would kill to date her. We wonder what her choices would be. Let’s get her on Tinder and find out! I hope the God supremo is listening to us and finally brings them on Tinder.